RAD Boarding is an apocalyptic snowboarding game jam-packed with 90’s flair! 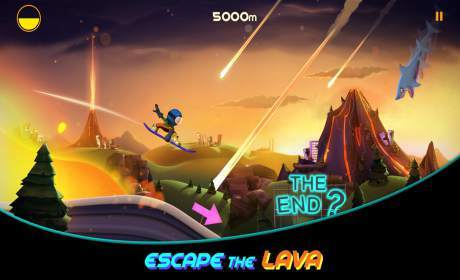 Perform gnarly tricks and fight crazy boss battles as you race against the end of the world. With epic visuals and tons of items to collect, RAD Boarding lets you ride out the Apocalypse in style! • Sweet Environments – Work your way up through ever increasing challenges, adventuring through the grasslands, desert and jungle until you reach the ultimate challenge of the Ice Lands. 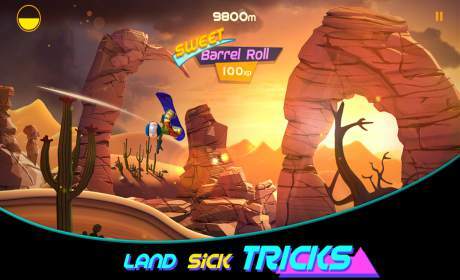 • RAD Mode – You’ll need to perform FLY combos to activate RAD Mode and crank the awesome levels up to 11! Maintain RAD Mode to slow down the lava. • Sick Tricks – Ride out the end of the world in style with some smooth tricks. Unlock new abilities as you level-up and chain them together for a sweet variety bonus. 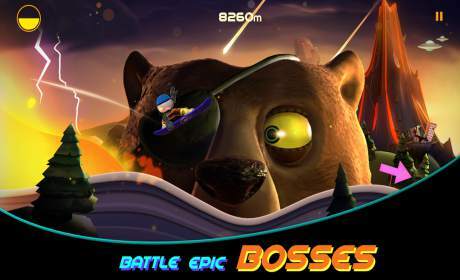 • Epic Boss Battles – Face off against Tiny the Bear in adrenaline-fueled boss battles. You’ll need to impress Tiny with your PHAT tricks to stay alive! • Pop the Frogs – Discover rare frogs on the slopes and pop them for cool rewards! Earn costume pieces to unlock new threads and sets of Milk Caps for bonus rewards!